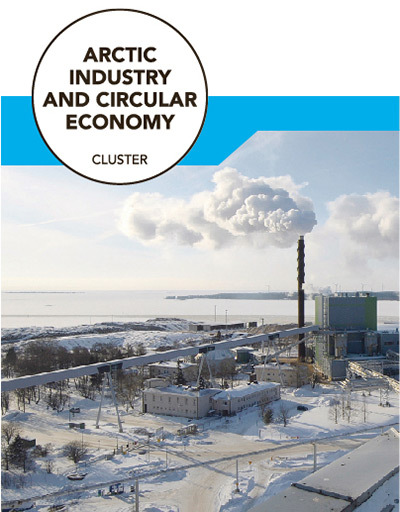 Arctic Industry and Circular Economy Cluster connects process- and mining industry companies, SMEs serving industry, universities, research institutions, funding and regional authorities to a same co-operation network. Common goal for Lapland is to be a frontrunner in sustainable utilization of natural resources and sustainable industry and circular economy activities. The work in progress for sustainable industrial refining has been notified on national, Nordic and EU levels. Systematic cluster development started in 2014, when Lapland was chosen as one of the model regions of European cluster initiative with six other regions. Lapland has been able to innovatively benefit from natural strengths of the region for cluster development. Selection for showcase, has led to strong, still ongoing, cooperation with European Secretariat of Cluster Analysis (ESCA). With the establishment of this cluster hosted by the regionally operating development agency Digipolis Oy, the Region of Lapland has taken a very important step in contributing to the development and strengthening of the circular economy related activities. Sitra (Finnish Innovation Fund) published the national circular economy road map (2016) for years 2016-2025, which collates the best national pilots, ideas and practices in the field of circular economy. Sitra has set the goal for finding the best models and apply them throughout Finland. One of the key initiatives of the road map is Kemi-Tornio circular economy innovation platform, where the idea is to create tools for companies through open, cross-sectoral and network based co-operation to improve the utilisation of industrial production and society based side streams. In June 2017 Sitra decided to establish a national Bio and Circular Economy Centre in Kemi. Centre is natural cause for ambitious and determined work in the region. Bio and Circular Economy Centre gathers together the experts, who response to business initiated circular economy challenges based on network model built during past years. In Lapland, resource efficiency and smart utilisation of raw materials in addition to increasing self-sufficiency are targets that are creating competitive advantage for industries in Finland and European Union. Mining and metallurgy have an important role when pursuing these targets, which has led to systematic development of industrial circular economy activities in Lapland. During 2013 Lapland started an active communication with European commission and other international stakeholders. As a result, and most developed example, The Regional Council of Lapland took a leading position on initiative of building a network of mining regions in the EU and invited other interested regions and partners on board. The network was launched together with European commission DG GROW unit of Raw Materials and Resource Efficiency. Process was supported by East & North Finland EU Office, ERRIN (European Regions Research and Innovation Network) and European Committee of the Regions. Based on mining regions network, Regional Council of Lapland is coordinating REMIX Interreg Europe project, which includes nine other regions. Circular Economy Cluster partners, Geological Survey of Finland (GTK) and Natural Resources Institute Finland (Luke) have formed successful partnerships under the Horizon 2020 programme. The Geological Survey of Finland (GTK) is an active partner in the Arctic Industry and Circular Economy Cluster especially in terms of the mining industry sub-cluster. In the Horizon 2020 call for projects in 2017, the cluster cooperation resulted in two new projects that will be implemented in 2017–2020. The MIREU (Mining and Metallurgy Regions of EU) project will produce a European network of regions with economic interest in mineral raw material production. In addition to GTK as the MIREU coordinator, the Regional Council of Lapland and the University of Lapland are included in the consortium as core project partners. GTK also participates in the other Horizon 2020 project MINLAND, which concentrates on land-use issues associated with mining industry. With the support and contacts provided by the Arctic Smartness clusters, another active arctic Industry partner Natural Resources Instute Finland (Luke) achieved partnership in a Horizon 2020 project ROSEWOOD (European Network of Regions on Sustainable Wood Mobilization) in 2017 – the first one for the institute in Finnish Lapland. “The two-year experience with the Arctic Smartness society has thoroughly changed my work and also my attitude towards regional cooperation and internationalisation”, says Dr. Kari Mäkitalo, Senior Scientist from Natural Resources Institute Finland. All these European partnership projects will benefit from the strong and ongoing Arctic Smartness cooperation in Lapland. Ecosystem of the Arctic Industry is an operational environment and unique innovation platform. Management of by-product processes of industries and process optimisation in the Kemi-Tornio region is a prioritised issue. The annual volume of by-products and residues of Kemi-Tornio large scale industries amounts to 1,7 million tonnes. Rovaniemi is the administrative centre of Lapland and an important regional centre of public governance for mining in Finland. 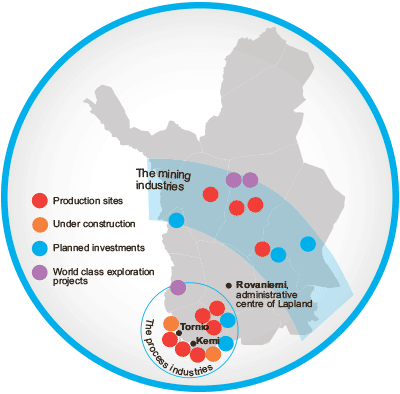 Mining industry is active throughout Lapland. With the long traditions in Lapland the coexistence between industries using natural resources has been amicable.